Correction, 10 p.m., Dec. 15: Bob Barron is Chief Financial Officer. 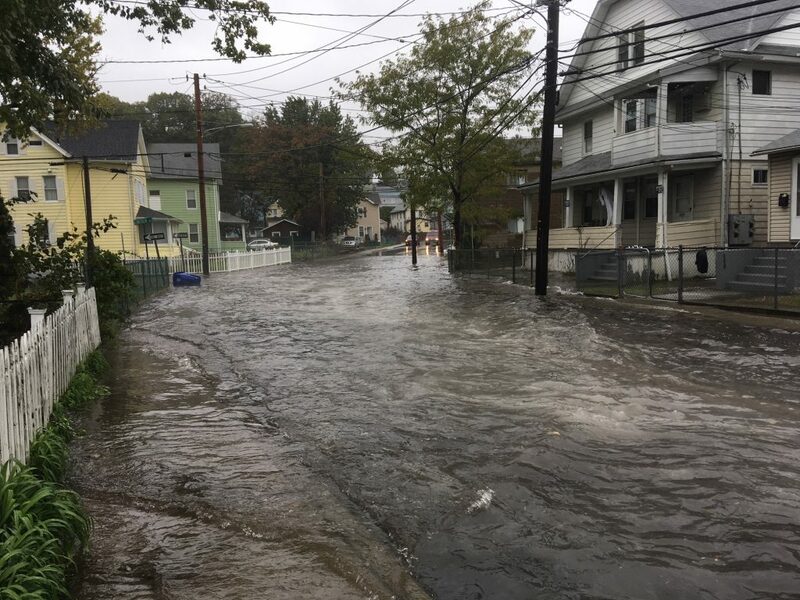 NORWALK, Conn. – Norwalk Common Council members are set to vote Tuesday on Mayor Harry Rilling’s request for a $1 million special appropriation to begin work on flooding issues. If approved, the funding would begin to address issues across the city, Department of Public Works Superintendent of Operations Chris Torre said at last week’s Board of Estimate and Taxation meeting. “We have identified 26 areas where either the pipes need to be increased or decreased, dredging, curbing, a lot of things that go along with storm water management,” Torre said. The proposed spending would be funded with $650,000 that had previously been earmarked for culvert and brook improvements on Keeler Brook, near Rowayton Avenue. The other $350,000 would be funded by issuing general obligation bonds in an authorization already approved for the Keeler Brook project. Thus, the City’s debt would not increase beyond what has already been authorized, according to Chief Financial Officer Bob Barron. 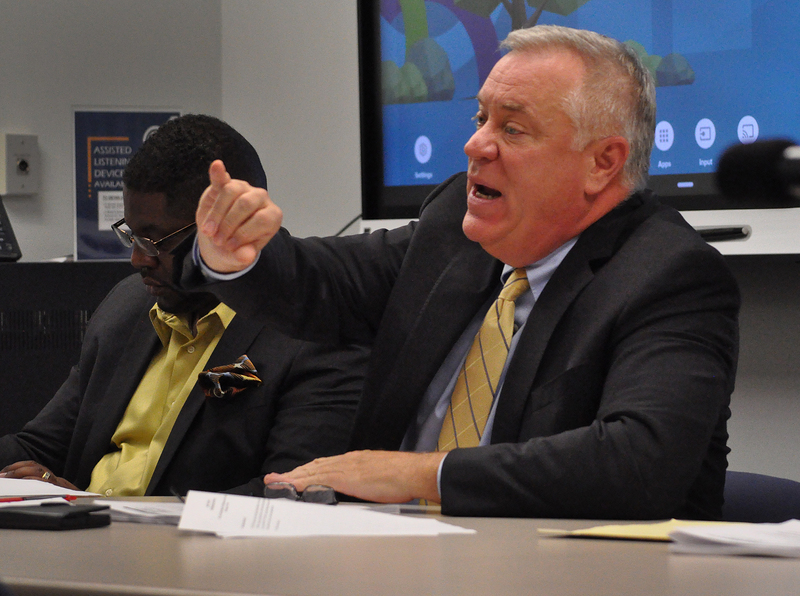 Norwalk Chief Financial Officer Bob Barron at last week’s Board of Estimate and Taxation meeting uses his pinkie to represent the $350,000 piece of the $1 million funding planned to be used on storm water issues. Barron at last week’s Board of Estimate and Taxation meeting called the $350,000 “authorized but unissued debt.” This is the authorized debt that has been presented to rating agencies as part of maintaining Norwalk’s triple a bond rating. The new spending would be in addition to $290,000 that has been appropriated over the past four years to address storm water issues, Barron said. “Chances are the need will be greater but there is an affordability aspect to everything and since we already had this appropriated, (the Keeler Brook project) was recently closed, the mayor asked that this $1 million be put in to address this immediate need,” Barron said. The Keeler Brook plans, which date back years, fell through because a property owner wanted more for his property than it was worth and the City did not want to use eminent domain, Torre said. DPW will work with CH2M Hill Engineers, Inc., a company doing work under Water Pollution Control Authority (WPCA) contract for an additional $150,000, to identify priorities. “They will analyze hydraulics of pipes, areas that need to be dredged,” Torre said. “This is just a drop in the bucket. We have been getting tremendous flooding issues all throughout the city,” Mayor Harry Rilling said. Residents are complaining that they have lived in Norwalk for decades and never had a flooding issue, but do now, he said. Twice in the last month and a half, there was two feet of water on West Avenue and water gushing up out of storm drains, he said. The $1 million is an initial investment in long-term issues which have “not been overlooked but we are doing the best we can,” Torre said. It’s prudent to assume that the trend of downpours will continue, Rilling said. With rising sea levels and increased threats of major storms why the reluctance of City officials to explore creating storm flood gates as Stamford did decades ago with considerable success. A major flood would devastate Downtown. Good to see the City seeking outside engineering expertise. Why not do the same with the very major dislocation for years from the Boondoggle Bridge ? As well as identifying costs to City residents and businesses ? Flood mitigation is necessary. One million probably is a drop in the bucket. Produce a detailed plan please – don’t just ask for money 🙂 Management 101. The City needs to particularly address the serious public health issue caused by the interconnections between the storm drain system and the sanitary sewer system. In our neighborhood (between Ward Street & Main Avenue), rain water flows into the catch-basins which then dump, not into a creek or drainage swale, but into the sewer lines carrying waste. Heavy rains overtax the sewerage system causing backflows of sewerage into our homes. Aside from the obvious “ick” factor and health risks, the current configuration of storm lines draining into the sewer lines is costing the City money because we are adding rainwater to our wastewater and then paying to treat it (as we do all sewerage). Perhaps the City (which has known about this problem for years and refused to address it) might finally figure out that funding repairs to this broken system will save considerable money in the near and long-term. And maybe the prospect of saving money will finally inspire Norwalk to put an end to an on-going public health concern. Has anyone suggested to hold off in building anything else on water st thats telling Rich no high rise until the work is done? Thats telling RDA no new housing . “They will analyze hydraulics of pipes, areas that need to be dredged,” Torre said. Isn’t that something the Army Corp does? The have to give the ok for Eversouce to cross water st, no chance this is something they do? What a joke this is Mr Torre where did you get all of your background from? Some Commission members in Norwalk have received the emails sent and sent back from the Army Corp on flooding on water st , its been an ongoing conversation for months any chance you call them and see if they can help? Harbor Shellfish and water quality commissions were asked to do what? Put them s the box Harry and see what opposition you get. There is something wrong here folks . Some of NON articles including video have been classified by the Army Corp whats that suggest? Lets not wait any longer for Norwalk city hall call them ask them what they can do and maybe it will save the city . Look at what the US army Corps do and see of we can save some money. CH2M Hill Engineers, Inc., a company who gets 25.00 an hour to cut the grass at the pumping stations are they not? Want pictures that may suggest that? No one has suggested new drains new buildings where dirt lots were on raymond and day have escheated the flooding along South Norwalk? Developers are raising the level of the streets and land , its taking more land that was dry and making it a flood zone Norwalk knows this and it seems to be missing rom Torres details. Address issues across the city get everyone involved stop creating an island around city hall Norwalk has enough of them . Aging infrastructure, if that’s deemed to be the cause of it, why not have work tacked onto the bridge, the power company and the work planned by the RDA and developers , Most of the water mains in South Norwalk in the flood plain areas need replacing why isn’t SNEW not sitting at the table also, as it is Harry had the streets done in South Norwalk making flooding worse where was Torre then? At Lunch? Call and ask your tax dollars are at work here.. Ask about the new flooding caused by Norwalks new construction and raising of roads and land in the flood zones see what they can do for Norwalk. Off topic, but couldn’t help but notice the house to the right in the photo. It looks like it could be slapped with a violation or two, maybe? Oh, never mind. P&Z is busting murals these days, not blighted houses.